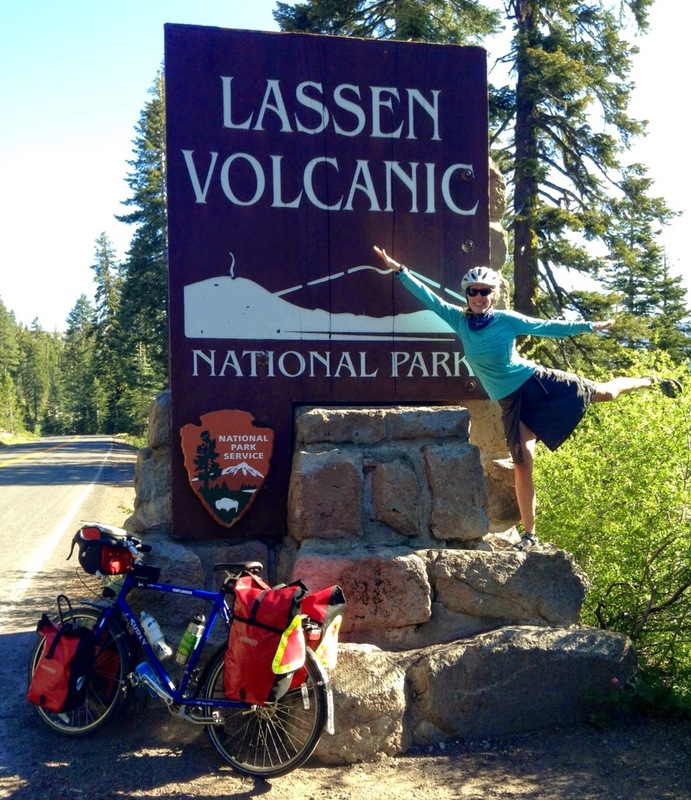 To be honest, I'd heard of neither Mt Lassen nor Lassen Volcanic National Park before this trip. And after having seen Yosemite last week, Lassen pales in comparison. 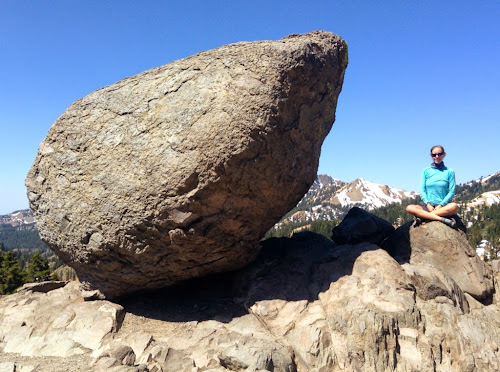 There just aren't any specific sites at Lassen that are screaming "grandeur" and "spectacularness." 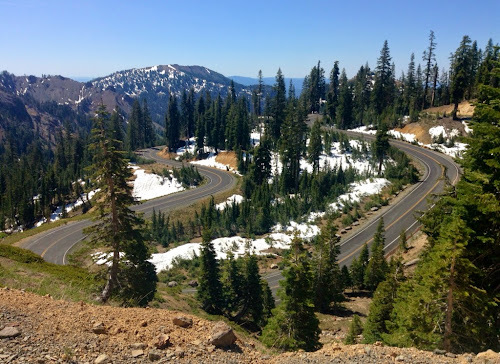 While I wouldn't recommend Lassen as being one of my favorite national parks, riding through Lassen offered some of the most pleasant riding of the entire trip. There was hardly any traffic at the park, which meant that we had the roads mostly to ourselves. The quality of the roads was impeccable, and there was not a single bit of roadside rubbish. 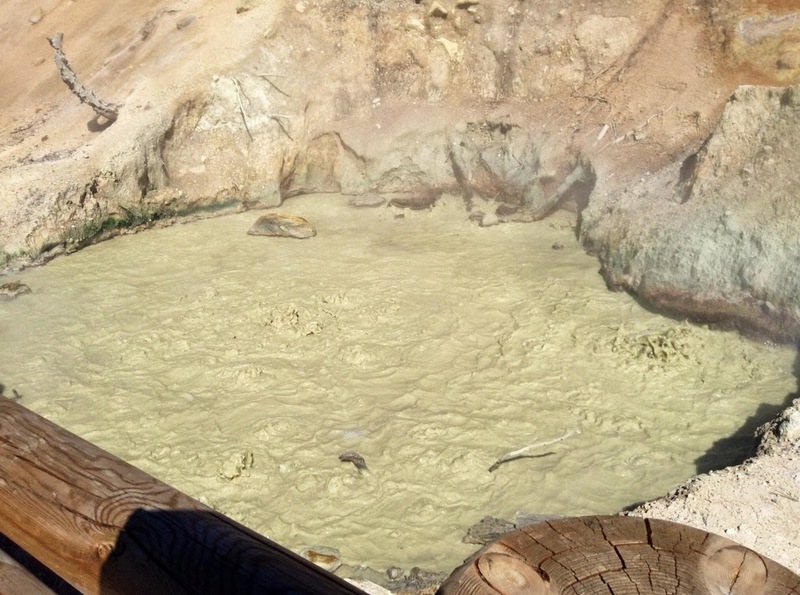 Most importantly, the park was just plain ol' gorgeous -- the trees, the rocks, the water, the bubbling vats of mud. A vat of bubbling mud at "Sulphor Works," in Lassen. There was quite a bit of snow at Lassen. This was the most snow we've seen the entire trip. 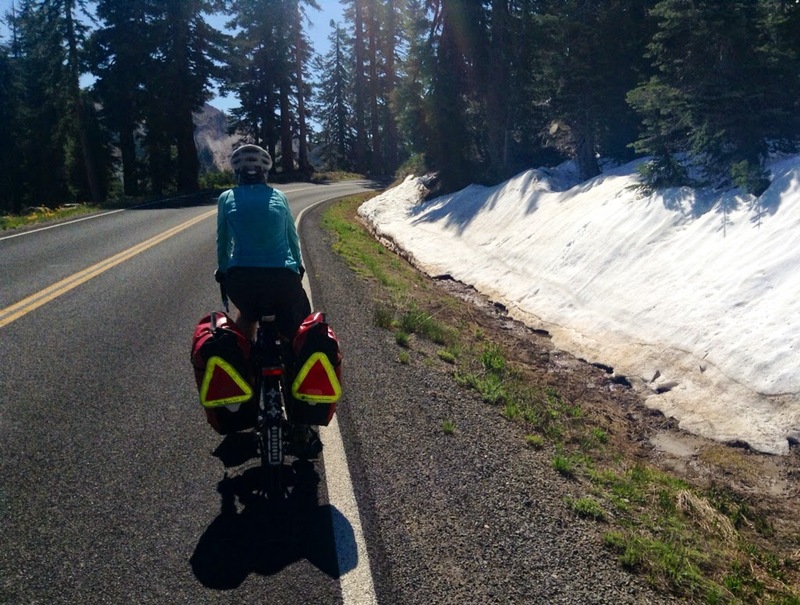 Riding by the pockets of snow was like riding along an air conditioner -- the surrounding air was considerably cooler. Snow along the roadside at Lassen. When climbing a long ascent, I love to look back on the winding road below. It makes me feel as though I've made great progress. Part of the winding road that we had climbed. Sitting aside a balanced rock at the trailhead to Bumpass Hell. Our highest point today was Lassen Peak Summit, at 8,512 ft. This is the highest point along the highest paved road in the entire Cascades range. The summits around here make the summits I'm used to back in Washington state seem so wimpy. Just below Lassen Peak Summit, Lake Helen is covered in ice. After we left Lassen National Park, we began to see Mt Shasta in the distance. It's hard to believe that we'll be staying at Mt Shasta tomorrow evening. This trip is just one amazing destination right after the next! Like I told Alex, "After today's ride, we'll have less than 1,000 miles left to our trip!" Alex's response: "Only 1,000, huh? That just sounds weird." We're starting to see a lot more stretches of straight, level road as we head further north. For these stretches, Alex and I have begun to take turns drafting behind one another. This enables us to cover these sections at a fairly decent clip. It's nice to be riding a fully-loaded bike and look down at the bike computer to see a pace somewhere between 15 and 22 mph. One of Alex's strengths is that he is a super-duper strong rider on the flats. 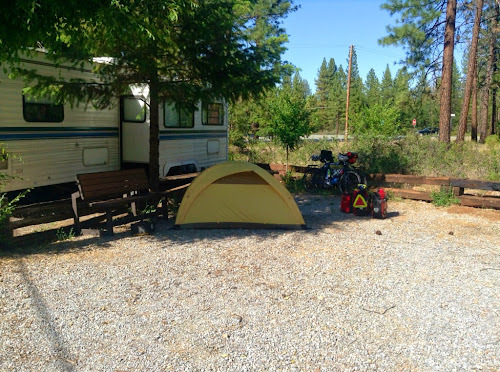 Another one of his strengths is that he is always the first to claim the shady, flat spot at camp. Let this be known to any future touring partners of Alex. Also let it be known that, whenever a shower is available, he is always the first to take a shower. The sacrifices I make to make sure my bike buddy is happy! While I've been pretty darn vigilant about applying sunscreen, the day-after-day exposure to the sun is starting to take its toll on my pale skin. Think, for a moment, of neopolitan ice cream. There are parts of my body (i.e. my upper thighs) that have yet to see sunshine. These parts are vanilla. There are parts of my body (for example, the tops of my lower thighs) that are constantly exposed to the sun and that have bronzed, even after being protected daily by 50 SPF. These parts are chocolate. 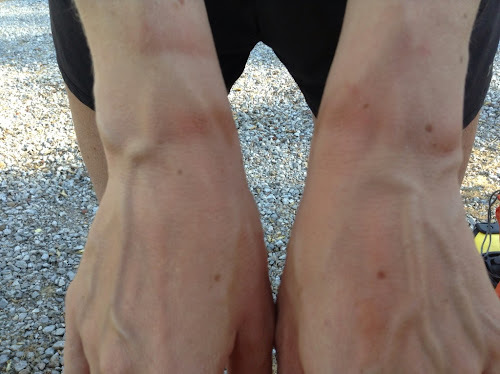 And there are parts of my body (for example, the tiny sliver of skin between my bike gloves and the bottom of my long-sleeved shirt) that manage to get exposed to the sun, and for which I can't, for the life of me, remember to coat with sunscreen. These parts are strawberry. The strawberry-colored marks of a biker who wears gloves and long-sleeved shirts. As I lay in my tent tonight, typing up this blog entry, I'm reflecting on our ride today through Lassen. There were so many little treats to the park that could only be appreciated from the saddle of a bicycle. I'm thinking of the small wildflowers on the side of the road that would look like a blur when flying by in an automobile at 35 mph. And I'm thinking of the sounds of water dripping beneath the melting snow that would be drowned out by the buzz of an automobile engine. 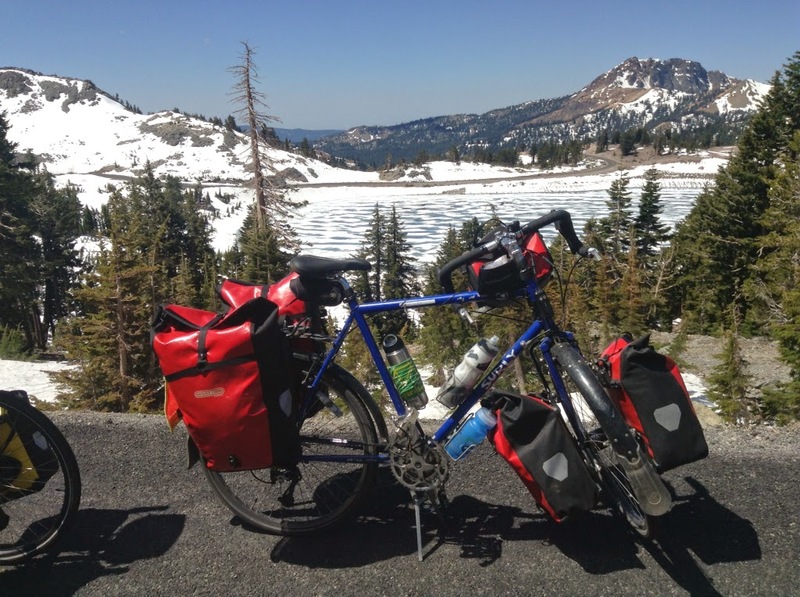 I tell you, my friends, the magnificence of places such as Lassen are amplified significantly when enjoyed from the saddle of a bicycle. I was only there one and it was with and ex wife and a car. Climbed (ok walked) to the 10000 foot summit and got buzzed by a glider. It is now on my list to cycle! Lady you are making that list very long! I would also like to express my happiness that the Swiss Army knife was not needed today.... Taking the parts out would be easy, but duct taping them back in later would be much harder! It sounds as though you've biked around Crater Lake. I've been wanting to do this for a few years now. I'm still unclear whether the road is open to bikes right now -- I've received mixed information. I guess I'll find out for sure in two short days! Last year I did the crater lake century. It is in August so it was hot but roads clear. It's early in the season so I can see why the info is fuzzy on the roads... I hope it is you will love it!